We designed Percona Monitoring and Management (PMM) to be the best tool for MySQL and MongoDB performance investigation. At the same time, it’s built on mature opensource components: Prometheus’ time series database and Grafana. Starting from PMM 1.4.0. it’s possible to add monitoring for any service supported by Prometheus. # install docker and docker-compose. At this point, we are running exporter, PostgreSQL and the PMM server, but pmm-client on the PostgreSQL server isn’t configured. Now we configured pmm client and added external exporter. External exporter for PostgreSQL output: http://localhost:9187/metrics. 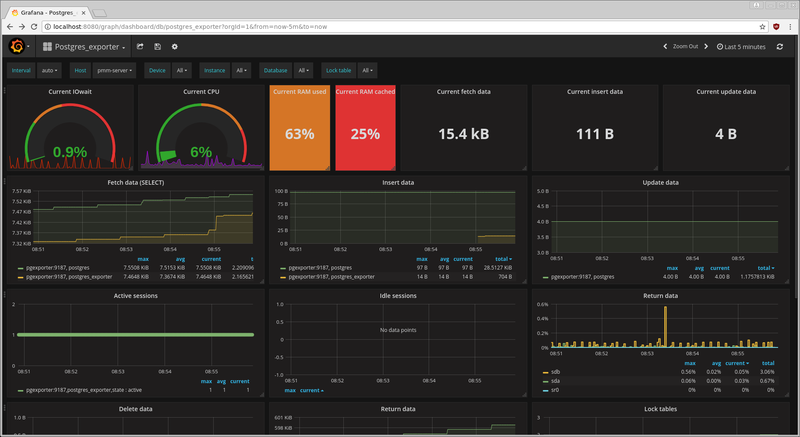 Go to your PMM server web interface and press on the Grafana icon at the top left corner, then dashboards, the import. Copy and paste the dashboard ID from the Grafana site to “Grafana.com Dashboard” field, and press load. In the next dialog, choose Prometheus as a data source and continue. To move this configuration to production, we need to understand how this demo works. First of all, you need an existing PMM Server. You can find details on new server configuration at Deploying Percona Monitoring and Management. In my demo I’m starting PMM without volumes, and all metrics dropped after using the docker-compose down command. Also, there is no need to use port 8080 for PMM, set it up with SSL support and password in production. Of course, you can use a dedicated PostgreSQL server instead of one running inside a docker-compose sandbox. The only requirement is that the PMM server should be able to connect to this server. To simplify setup, you can use a superuser account and access pg_catalog directly. To improve security, allow this user to connect only from exporter host. You can obtain database-only statistics with just the external exporter, and you can use any host with pmm-client installed. Fortunately, you can also export Linux metrics from the database host. After installing the pmm-client package, you still need to configure the system. We should point it to the PMM server and register the external exporter (and optionally add the linux:metrics exporter). It’s important to keep the external exporter job name as “postgresql”, since all existing templates check it. There is a bit of inconsistency here: the first postgresql server is added as external:metrics, but all further servers should be added as external:instances. The reason is the first command creates the Prometheus job and first instance, and further servers can be added without job creation. pmm-admin add external:metrics or pmm-admin add external:instances are not required if you are running exporter on the same host as pmm-client. As you can see, it’s a self-describing set of counters and string values. The Prometheus time series database built-in to PMM connects to the web server and stores the results on disk. There are multiple exporters available for PostgreSQL. postgres_exporter is listed as a third-party on the official Prometheus website. You can compile exporter by yourself, or run it inside docker container. This and many other exporters are written in Go and compiled as a static binary so that you can copy the executable from the host with same CPU architecture. For production setups, you probably will run exporter from a database host directly and start the service with systemd. In order to check network configuration issues, login to pmm-server and use the curl command from above. Do not forget to replace 172.17.0.4:9187 with the appropriate host:port (use the same IP address or DNS name as the pmm-admin add command). Make sure that you provide the correct credentials, including the database name. In order to simplify production setup, you can run exporter directly from the same server as you are using for running PostgreSQL. This method allows you to use pmm-admin add external:service command recently added to PMM. # copy exporter binary to database host, use scp instead for existing database server. In the demo, I’ve used Postgres_exporter dashboard. Use the same site and look for other PostgreSQL dashboards if you need more. The exporter provides many parameters, and not all of them are visualized in this dashboard. For huge installations, you may find that filtering servers by “instance name” is not comfortable. Write your own JSON for the dashboard, or try to use one from demo repository. It’s the same as dashboard 3742, but uses the hostname for filtering and Prometheus job name in the legends. All entries of instance=~"$instance" get replaced with instance=~"$host:.*". The modification allows you to switch between PostgreSQL servers with host instead of “instance”, and see CPU and disk details for the current database server instead of the previously selected host. This blog post on how to collect PostgreSQL metrics with Percona Monitoring and Management is not an official integration of PostgreSQL and PMM. I’ve tried to describe complex external exporters setup. Instead of PostgreSQL, you can use any other services and exporters with a similar setup, or even create your own exporter and instrument your application. It’s a great thing to see correlations between application activities and other system components like databases, web servers, etc. This article should be used only if you need an example for external exporters, e.g. to instrument your application or add a support for rarely used database engine.